Graduate level teacher candidates preparing to work with English learners participate in coursework related to theory and practice for many aspects of second language acquisition. In this presentation the author describes and discusses an innovative capstone project, completed in the context of the second language acquisition course, which conceptualizes and embodies performance-based assessments. What makes this exceptional is that teacher candidates demonstrate deep insight regarding the authenticity of using performance-based assessments with K-12 English learners while simultaneously connecting the concepts to their own pre-service teaching performance-based assessments; Portfolios2. 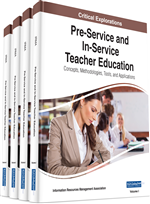 In the field of teacher preparation, a wide variety of assessments is used to document pre-service teachers’ performances related to university-based teacher preparation programs. In many cases, these assessments include performance-based systems of evaluation to showcase candidates’ outcomes related to the required learning expectations for the recommendation of initial licensure and teacher certification. Over the past decade alone many countries worldwide have examined and scrutinized how candidates’ performance can be assessed and measured to develop and improve learning outcomes. Specifically in the United States, education reform is in a critical moment for teacher preparation and teacher evaluation, whereby states across the nation are undergoing extensive changes with regard to the use of performance-based teacher evaluations. This movement for transformation also calls for increased innovation from teacher preparation programs so as to create and enhance the quality of teacher training as opposed to substituting long-standing prior challenges with new ones (Council for the Accreditation of Educator Preparation [CAEP], 2013; Darling-Hammond, 2014; U.S. Department of Education, 2010). Along this line of thinking, this presentation considers the idea that teacher candidates, and in this case, those working with English learners, can greatly benefit by extended exposure to the concept of performance-based evaluations. The innovative approach included in this information explores how teacher candidates themselves deepen their understandings of performance-based assessments, serving as an authentic pathway to demonstrate gained skills and knowledge. Likewise, candidates explore and discover the crucial aspects of using performance-based evaluations and assessments with their own K-12 English learners. Conceptual connections between the two avenues for using performance-based assessments solidify and reinforce the importance of these assessments and their focus on authenticity with teacher candidates as well as with English learners.